Oven Cleaners Bromley BR - Home & Commercial Kitchen | Quality Property Care Ltd.
Quality Property Care Ltd. is a professional oven cleaning company, which provides residential and commercial oven cleaning. We deep scrub all types of ovens for professional kitchens, offices and homes in Bromley BR and the area. The oven cleaning service involves the disassembly, cleaning, soaking and scrubbing of every part and then reassembly of the oven. The service is provided by certified, vetted and insured cleaners at a great oven cleaning price. Apart from the deep oven cleaning, you can book microwave cleaning, cleaning of your freezer, fridge, cooktops, warming drawers, grill and BBQ, as well as an overall domestic and commercial kitchen cleaning. Cook healthier food and save energy after the eco-friendly deep oven cleaning service. No matter the type of cooker or oven you have, contact us by phone or online right away, and get a free quote for the requested service. To properly clean your oven, regardless of its brand and size, we use a dip tank method to degrease all removable parts of the oven. First we take apart anything we can, extractors and trays are put aside and dipped into a special mixture of water and a degreasing detergent. That way they are fully stripped from even the stickiest of grease patches. Extractor filters, trays, light protectors, panels and control knobs are all removed and dipped in the tank to soak while the main service is being performed. After all parts are removed we start cleaning the burnt carbonised food leftovers. If left there this may cause damage to the fans and filters of the oven as well as affect the taste and quality of the food. To degrease the oven we use a special detergent which removes the bind of the fat molecules bound to the top of the oven panels. It leaves no trace and is harmless once wiped clean. We scrape any residual grease from the oven and the removed parts, all dirt and grime are removed with a special tool. The expert oven cleaners from Quality Property Care Ltd. have been cleaning the ovens of residents, restaurants and other professional kitchens in Bromley BR for many years. 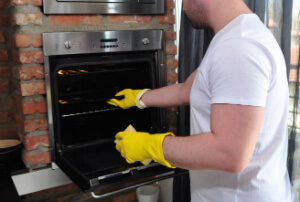 They are all experienced, trained and insured, so that the company can assure the quality of the oven cleaning service, and keep its leading position in the industry. The company also offers professional deep cleaning of almost all other types of kitchen appliances, as well as a full one off kitchen cleaning. Some customers book us for regular kitchen cleaning services as well. Regular customers as well as those who book multiple services get a special discount. 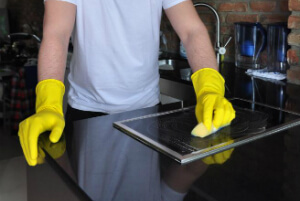 Our professional oven cleaners have the ability to properly clean a wide range of hobs, stoves, ovens, ceramic hobs, hotplates, ceramic cooktops, gas grills, BBQ racks, gas hobs, Rayburn range cookers, microwaves, AGA cookers, Stanley range cookers, cookware, extractors, warm drawers, fridges and freezers and all of your kitchen appliances at once upon request. Proper cleaning for electric cookers and free-standing ovens, halogen hobs, ceramic and induction hobs. This cleaning services are for commercial and domestic customers. We use special brands of detergents and cleaning materials to maintain the appearance and function of your range ovens. We are familiar with brands like Smeg Range Cooker, Rayburn Range Cooker, Rangemaster range Cooker, AGA range cooker, Alpha range cookers, Stanley range cooker. We can also perform tile and grout cleaning, ductwork cleaning and duct cleaning, dishwasher cleaning, structural cleaning, canopy cleaning, splash back cleaning and more. Don`t give up healthy cooking and don't risk the life of people around you! Get the oven cleaning Bromley BR deal now! Call us on 020 3746 4287 and get your free estimate or ask for additional information. Keep cooking tasty and healthy with Quality Property Care Ltd. and book professional oven cleaning service today!